The National Institute of Science and Technology estimates that the loss of information between the construction of buildings and their operation and maintenance costs facility owners $15.8 billion every year. This phenomenal loss is caused by inconsistent standards for capturing information about facilities and their equipment. 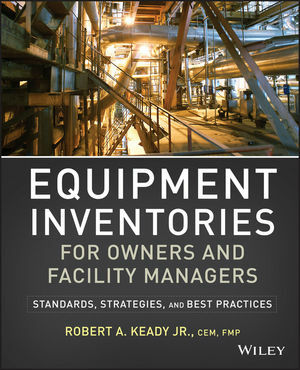 In Equipment Inventories for Owners and Facility Managers, Robert Keady draws on his twenty+ years of experience in facility management and his intimate knowledge of CSI classification systems and standards to tackle this problem head-on. Using standards already in use in the AEC industry, he provides the road map for capturing everything owners and facility managers need to know to operate and maintain any facility. ROBERT A. KEADY Jr., CEM, FMP, is a Certified Facilities Management Specialist for the United States government. Mr. Keady has more than twenty years of experience in facility management for various industries and is the CSI OmniClass Chairman for Table 23 - Products. He has been published in the Facilities Engineering Journal of the Association for Facilities Engineering, and is a frequent speaker and trainer.